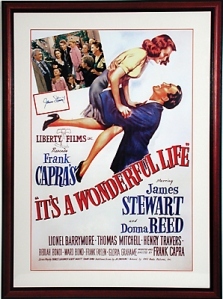 Frank Capra’s classic movie has won the hearts of millions of viewers around the world. It’s certainly an ageless film that seems to get better and better with each passing year. James Stewart is perfectly cast as man who has worked all his life to make good in a small town. Thinking he has failed, the frustrated man decides to put an end to his life. An angel suddenly appears and tries to help him by showing him what life would have been if he never existed! With an endearing message that says “No one is a failure who has friends”, “It’s a Wonderful Life” is a heartwarming tale that will surely win you over completely; it has become one of my personal favorites through the years. So if you’re looking for a really good christmas movie to watch this year, I suggest you watch this one; it’s one of the most wonderful films I’ve ever seen. A life changing experience. Fun fact: James Stewart was nervous about the phone scene kiss because it was his first screen kiss since his return to Hollywood after the war. Under Frank Capra’s watchful eye, Stewart filmed the scene in only one unrehearsed take, and it worked so well that part of the embrace was cut because it was too passionate to pass the censors.